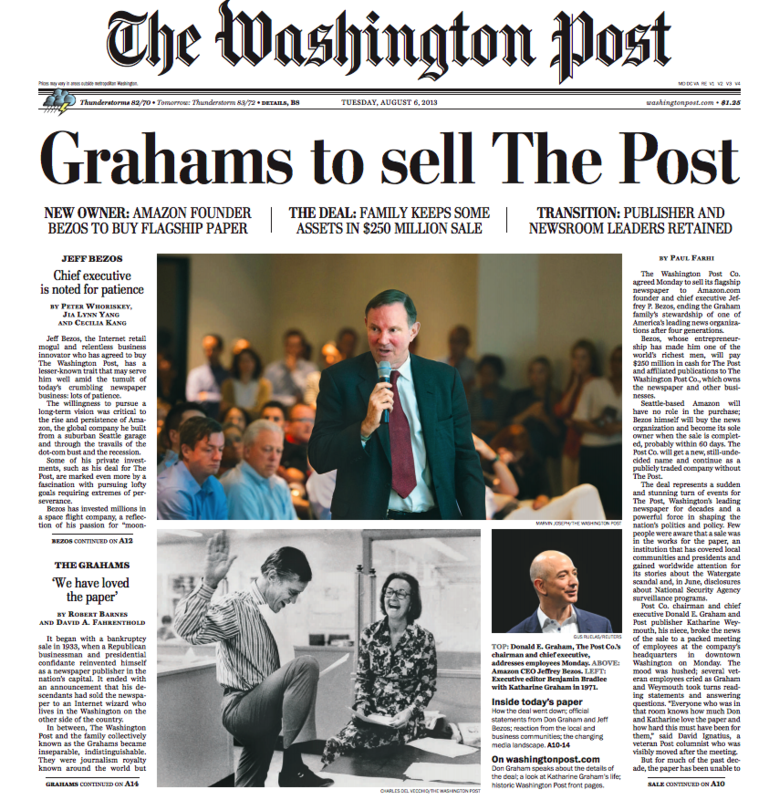 The news that Jeff Bezos bought the Washington Post was a shock. Almost as shocking was the textbook way he handled the delicate communication to employees. The Post is much more than a newspaper. It’s practically a national institution — one that many people, not the least of which are its employees, hold dear. So it was important that the new owner start things right. And did he ever. My first paying job as a kid was as a paperboy delivering the Washington Post. The smell of newsprint still brings back a vivid sense memory of pre-dawn mornings making the rounds just as the birds were awakening. I’ve been a Post reader since I was 11, starting with the comics and Ann Landers and moving up to political news. Woodward & Bernstein were the reason I worked on my high school and college papers and thought seriously of becoming a journalist (before I thought better of it). In my 20s, I was a dedicated subscriber. My morning paper was delivered by “carriers” driving cars, not boys and girls on foot. At one point I was having delivery issues that the circulation department couldn’t resolve. So I dashed off a polite letter to then-publisher Donald Graham, expressing incredulity at the irony of living a mile up the street from the Post’s offices and not being able to get a paper on my doorstep by breakfast time. I still have a copy somewhere of his courteous reply and his promise to get the problem fixed. When I left DC I measured all other dailies by the Post’s standards and found them sadly wanting. As far as I was concerned, there was a first tier of papers, which included the Post, the New York Times and the Wall Street Journal, and there really was no second tier — just a bunch of distant thirds. Hell, the Post’s letters to the editor were smarter than most papers’ lead editorials. In recent years the Post started slipping (as most papers have). It’s become very much a part of the entrenched establishment, and the editorial pages are a bizarre spectacle, lurching rightward and supporting wars and causes that surely have dear Katie Graham spinning in her grave. And yet, when the stunning news came this week that the paper was sold (and hat tip to those who managed to keep this incredible secret), it really hit me. 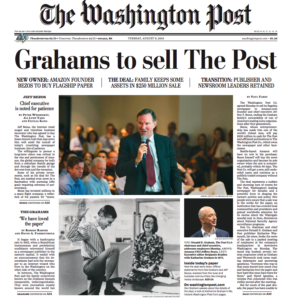 For many people, The Washington Post and the Graham family are inseparable. I have no idea what Jeff Bezos’ ownership will do for (or to) the Post — there are plenty of smart analysts parsing that out. But I was mightily impressed with his letter to the paper’s staff. The Poynter Institute offers some sharp insights here (see especially the second half of the article). I would add that it is a textbook case on how to conduct smart, sensitive employee communications in a time of fear and uncertainty. 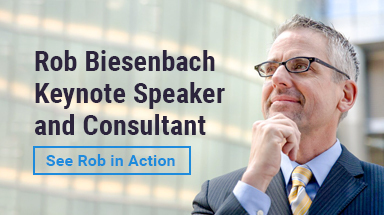 He accomplishes all of this with simple, pure language devoid of jargon and the usual corporate BS. This memo wasn’t written by a committee or vetted by an army of lawyers. 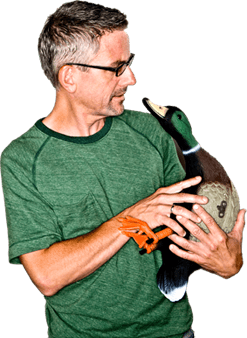 It’s one human talking to other humans — the way writing is supposed to be. As I said, I’ve been disenchanted with the Post in recent years, and who knows where this will eventually go? But as a former “newsie,” I think this initial communication is a positive start.